I agree with the first and third canned responses. I have a problem with the use of the second canned response. I fully, 100% disagree with the use of the second canned response. This canned response is cold, and not helpful to flaggers at all to understand why their flags are declined. While there are those moderators here on Ask Ubuntu who will use the "Other...." reason to actually describe the reasoning (and kudos to those mods for taking the time to do this), other mods just blindly use the "no evidence" cananed response without explaining the reasoning. 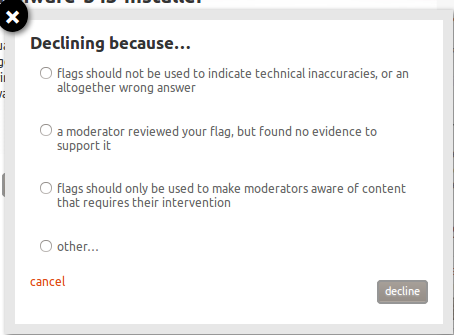 I'm tired of seeing this in my flags feedback, because then I have to hunt down the moderator and ask for the description of why. Can we just have mods extremely limit the use of that canned response and have the moderator give a better description of why the flag is declined by using the "other" option to put a description? A moderator reviewed your feature request, but found no evidence to support it. But in seriousness, the only time I ever decline things without saying something is when it isn't obvious. I do make assumptions based on what people should know, I assume they've read the FAQ and they understand the technical side of the posts they're flagging. In my eyes, most of the time it is obvious. Flag messages are very often completely absolute, like "This is really off topic", "This hasn't answered the question" or "1+1=3". If I decline one of those, it's obvious that the reason I'm declining is because I don't agree. As a moderator, I don't want to discuss every little thing when I disagree with somebody. I'm not here to transcribe the FAQ and meta discussions into 140 characters for every incorrect or disputable flag. Of course if you do get a message you don't understand, open up a Meta question (like you have today) and discuss what's going on. Moderators get notifications of all new Meta questions. TL;DR: If I think that my disagreement is clear enough, you'll get a canned response.